We love it!!! It looks so real, like we could actually touch her. 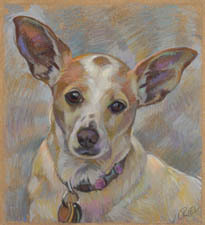 We are sooo happy with the portrait - you are amazing and you captured our Zoe girl's gentle spirit beautifully! You've done it again!!!!!! Wow. You have captured Sebastien to a tee. Janice just forwarded the photo of the piece and it is spectacular. I can't believe how special it is. She mentioned you might be coming out this way. Please I would love to meet you and express what great joy and pleasure you have given me with these portraits. Thanks again. 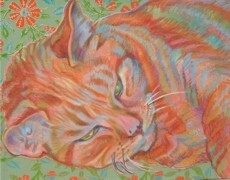 "Hi Jane - Tuffin's amazing portrait arrived today - right on time. Simply amazing - so dear, so darling and so Tuffin. Thanks for the framing hints. I can't wait to take it in and find the perfect frame for the perfect portrait. Such fun. How happy you've made me with your awesome talent.... It is so amazing to work with a person of such skill and most of all understanding of the subject". "Jane… I just 'really' looked at the painting. Had a quiet moment to do so and am thrilled and amazed. It made me cry. You have such a way and captured a beautiful spark of this animal and his personality. Wow! His little sparkle in his eye is so him.. Thanks for an amazing picture… hopefully many more to come. You are so talented." 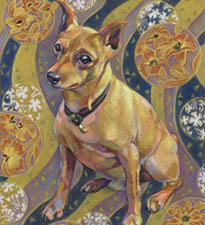 "On a whim I decided to see if Escher made it on to your website and, like a proud mother, beamed when I saw his portrait leading the group on the Pet Portrait page! I love the oil of Escher – look at it every day. Can’t wait to have a reason to get the other dogs done." "Dear Jane, Thank you for a very Great job done. Dan and I are so pleased, beyond words. We can't wait till the rest of the clan is done." "Oh, Jane, it's beautiful!!! I love it! You really captured him. Thank you sooo much. This special piece of artwork will always be a part of our family." 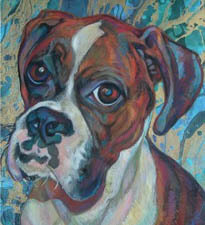 - Gaylen Corbett, Dana Point, Calif.
We LOVE the portrait! I knew that you were the right artist to do this for us. It really captured their individual spirits and we love how you did the background with the rug, etc. Thank you, it is awesome-- we are very happy!!" 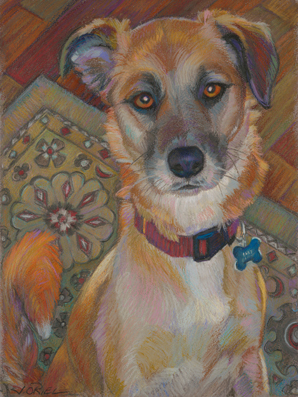 - Jeff F. Moss Beach, Calif.
"Dear Jane, Thank you so much for the truly extraordinary pastel painting of Jake Jasmine & Scratch! You have managed to reproduce their faces and expressions in a work of art that Hugh and I will treasure forever. Everyone who has seen the painting has commented on how accurate the likeness is and how deftly you have captured the dogs' personalities and moods. We are thrilled, also, with the stunning, soft-hued palette you chose and the imagination and skill you put into capturing incidental details: dog collars and licenses, the adorable white patch on Scratch's chest, plants and flowers in our yard, the ochre color of our front steps, the black railing on our porch, and so on. These are the marks of a truly accomplished artist! Thank you for all the care you put into the execution of our painting. Warmest regards." 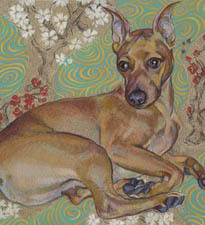 - Noah G. Berkeley, Calif.
"Thank you a million times over for the portrait you did of my dog Lucy! It is truly amazing and I started to cry immediately when I opened the package. You somehow captured her entire personality in the painting. I was blown away. I couldn't have asked for a better tribute to her.... I am also honored that you put her picture on your website homepage!!! Thanks again." - Audrey R. Berkeley, Calif.
"I just wanted to say thank you again for creating such a special gift. 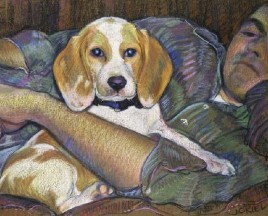 The portrait is a beautiful piece of art that captures Elliott and Dot perfectly. Being able to meet you made it even more special. Elliott's comment was that there was nothing that I could have given him that would have been more perfect. Thank you again for your time and creation and I look forward to perhaps another piece." - Rick B. San Francisco, Calif.
"Jane, we all loved the painting. You did a fabulous job. You really caught Ruby's inquisitive, ready but not wild curiosity. A fantastic portrait....and Jess is definitely in the background protecting, it is a beauty. Thanks for putting your heart into it." "Absolutely outstanding. This is Forrest for sure. You have outdone yourself, not really, everything you do is to perfection with not only the art but the emotion.I just love it and Dan will probably faint!!!!!" - Jan P. SF, Calif.